One of the most fondly recalled local institutions, the Lakeville State Hospital originated as a tubercular sanatorium in 1908 and 1909. Originally opposed by some local residents who feared the presence of a tubercular hospital in their midst, the state sanatorium came in time to be a welcome addition to the community, long afterwards referred to with some affection as the “San”. 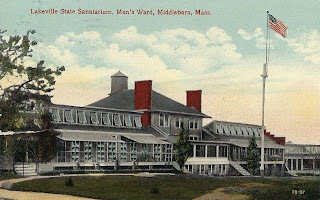 Recognizing the need for hospitals where tubercular patients could be isolated and treated, as well as the inadequacy of the existing state sanatorium at Rutland and other state institutions to cope with the sheer number of tuberculosis patients, the 1907 Massachusetts legislature authorized the establishment of three new state sanatoria, including one for southern Massachusetts in yet undetermined location. Sites for the three new sanatoria were quietly scouted under the direction of Dr. Sumner Coolidge of Watertown. A one-time public school music teacher, Coolidge had acquired his medical degree from Harvard in 1900 before embarking upon a career as a physician and medical officer with the Isthmian Canal Commission in Panama. For the southern Massachusetts sanatorium of which he was to be appointed superintendent, Coolidge investigated a number of sites including one site in East Middleborough, Dr. Edward S. Hathaway's "Fairview" property (which at the time was open land between the Nemasket River and Fairview Street), and the Stetson Farm in Lakeville. 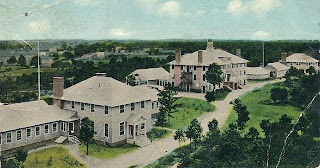 Wary that Middleborough might eventually be chosen to play host to the institution, the Middleboro Business Men's Club, concerned about the infectious nature of tuberculosis and the presumed public health threat a sanatorium might pose, made it publicly known that it considered it "inadvisable" that a sanatorium be located in town. Ultimately, however, it was in Lakeville that the sanatorium would be located when Coolidge settled upon a portion of the Doggett Farm on Main Street as the eventual site, its elevation, southern exposure, and dry soil recommending it for this use. In order to stem any groundswell of opposition to the acquisition of the Doggett Farm, and to preclude any seller from taking advantage of the state by inflating their asking price, the Commonwealth did not purchase the property directly, but, rather through Coolidge as its agent. Sixty four acres of the farm, including the Doggett farmhouse, were purchased from Lakeville Selectman Fred A. Shockley who owned the property in conjunction with A. Davis Ashley of New Bedford. To Shockley, Coolidge represented "that he was buying a place on which to erect a massive country residence for himself, and outlined a series of improvements which would be carried out on the estate. He said the grounds would be handsomely laid out, and that there would be expansive lawns, shrubbery and the rest, and that water was needed on the property to keep them in shape." Reputedly, there was little haggling over the price, Coolidge (and the state) agreeing to Shockley's asking price. "He paid practically the first price asked, and was well satisfied apparently with his bargain." The purchase was made on the first of September, 1908, at which time an additional ten acres on Rhode Island Road which adjoined the rear of the Doggett Farm and which included the small Lily Pond were bought from Frances King of Middleborough. Cooolidge dutifully conveyed the property to the Commonwealth that same day, and it was shortly following this that the state's proposed use for the property became common knowledge, creating in the words of the Middleboro Gazette, "considerable indignation among Lakeville residents." Undoubtedly, some of this ire was ascribable to Lakeville’s sense of having been "duped" by the Commonwealth. Accordingly, there was talk of initiating a petition opposing the location of the sanatorium in Lakeville, but this threat appears to have come to nothing. Part of the success for this must lie with Dr. Cooolidge, who surely relied upon public relations skills developed in Panama. Additionally, part of Coolidge's prescribed duties as superintendent of the sanatorium was public lecturing on the cause and treatment of tuberculosis. It was in his public capacity that he spoke at the opening of the Fall Brook Farm "automobile inn", on July 1, 1909, jokingly comparing the two institutions. Further the fact that Coolidge and his family were to make their home at the sanatorium (and, in fact, did so until the late 1920s), may have allayed the concerns of opponents. Eventually, when the 150 patient sanatorium opened in January, 1910, the Gazette was able to report that "the misgivings which existed shortly after it was announced the structures would be located nearby have since passed, and there is a general good feeling, and no one seriously objects to the location of the institution." Over time, the sanatorium's role would evolve, and the positive work accomplished there would endear the institution to workers, patients and local residents, alike. Ironically, an institution which acquired its site in 1908 under veil of secrecy for fear of local opposition, half a century later had become so familiar and popular a landmark, that in 1964 when the Commonwealth formally reinvented the sanatorium as Lakeville Hospital, "many local people who worked there or had been associated in some other way, found it difficult to think of it other than as the Lakeville Sanatorium, or, 'the San.' "
Top:Detail, "General View of State Sanatarium [sic], Lakeville, Mass. Unidentified postcard, c. 1910, paper. The view depicts the cupola-topped Administration Building at center with the smaller Dining Hall just to the left of it. Flanking the Administration Building are the Men's and Women's Ward Buildings. In the distance is Main Street. 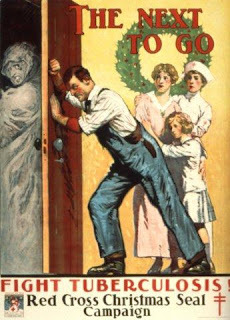 Middle Top: "The Next to Go", American Red Cross, poster, 1919. Middle Bottom: "Lakeville State Sanatarium, Men's Ward, Middleboro, Mass. ", H. A. Dickerman & Son, Taunton, MA, postcard, c. 1910, paper. The Men's and Women's Wards were identical wood-shingled buildings outfitted with expansive windows and skylights as both fresh air and sunlight were considered to aid in the cure of the disease. Patients would be wheeled in their beds directly onto the open porches. The Ward Buildings were constructed in 1909 and razed in the 1960s along with the other original sanatorium buildings. Note that the caption misidentifies the location as Middleborough. 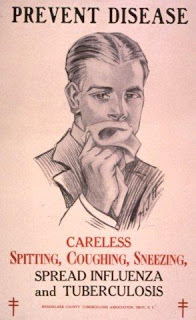 Bottom: "Prevent Disease", Rensselaer County Tuberculosis Association, Troy, NY, poster, c. 1925. Does anyone know what happened to the medical records from Lakeville when it closed? Presumably the records should be with the Massachusetts Department of Public Health which was the agency which administered the hospital prior to its closing in 1991. Their website is probably the best place to start. Good luck with the search! Very interesting to read these details about how the Lakeville Sanatarium came about through the efforts of my great grandfather Sumner Coolidge.